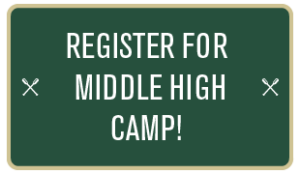 Middle High Camp is for campers going in to grades 9, 10, and 11. This six night session is full of traditional camp fun, while focusing on the development of our present and future church leaders. We consider it a great privilege to work with these campers on relationship building, peer issues, and leadership qualities that will carry the Episcopal Church forward in the 21st century. The cost for this camp session is $575 per camper and includes registration, meals, canteen, milk and cookies, camp t-shirt, and camp picture. If you have any questions at all, please don’t hesitate to reach out to us. Email [email protected] or call 318-765-3794.